In the company’s first years, Findécor’s painters used a 30 feet long ladder for painting at heights. 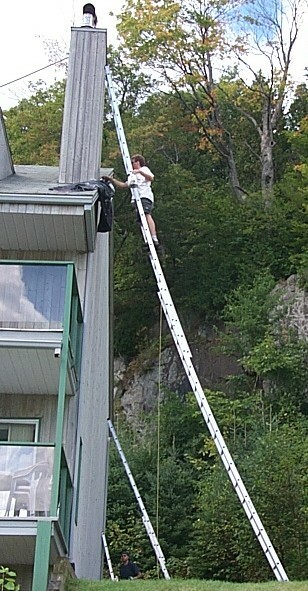 Of course, this method presented a fall risk, but our painters were used to it and were always very careful. For painting at heights contracts, we had the option of renting a lift and it made our work a whole lot easier even thought there were extra fees. That is why we decided to invest in a 40 feet high lift in 2012. First, the use of a lift for exterior painting diminishes the risk of falling, especially for painting a roof that has a 45° inclination. Moreover, the stress diminution will permit our employees to pay more attention to details, thus putting a greater quality in their work. Second, the lift improves our productivity as we do not need to move the ladder each 5 minutes or so, and there is no need to build tall scaffoldings. Thus, employees will waste less time and you will waste less money on their salary. The lift is the best option for shutter painting. We take the required time to remove the shutters, we paint well each side, and we reinstall the shutters once dried. This method is more esthetic because there won’t be any demarcation or drops on the surface. Our lift is hybrid, which means it pollutes less than other lifts. Findecor takes care of the environment! We also care about our clients’ health and we use low VOC paints. To learn more about VOCs, see our post What exactly is inside your paint container? As it is a tracked vehicle, our lift won’t ruin your lawn. Recently, a client told me that it would not matter to him if there were a couple a tire marks on his lawn. 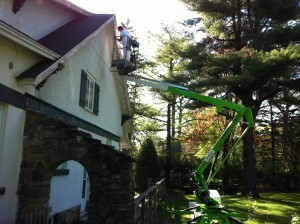 However, our painters are highly professionals, and they always give you the best service they can. Our philosophy is simple : we never do to our clients a work that would not be acceptable in our own home. Contact us now to request the services of a great team of painters!